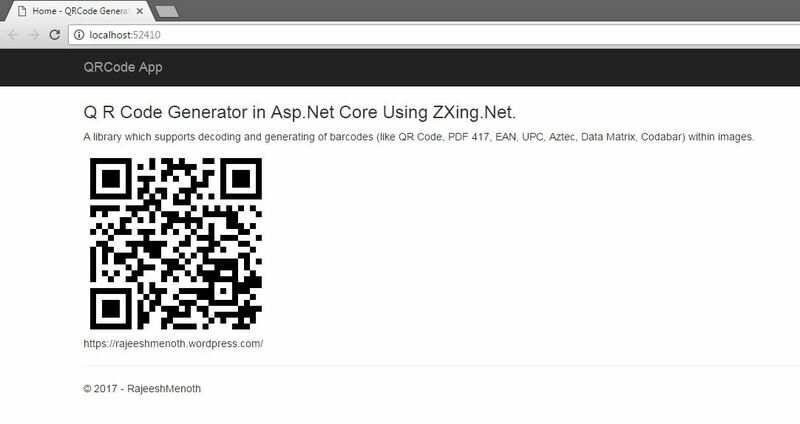 In this article, we will explain how to create a QR Code Generator in ASP.NET Core 1.0, using Zxing.Net. I tried to create a QR Code Generator in ASP.NET Core, using third party libraries but in most of the cases codes are not fully supported in ASP.NET Core because of some version issues etc. I searched a lot in Google but finally I found “Zxing.Net” and it is a library, which supports decoding and generating of the barcodes. I had a discussion with MicJahn and came up with a great solution. Before reading this article, you must read the articles given below for ASP.NET Core knowledge. A library, which supports decoding and generating of the barcodes (Example: QR Code, PDF 417, EAN, UPC, Aztec, Data Matrix, Codabar) within the images. The assemblies given below are required for QR Code Generator. We need the packages given below for drawing and creating QR Code Generator. QRCodeTagHelper class given below contains QR Code Generator methods etc. The code given below will display QR Code Generator. A library which supports decoding and generating of barcodes (like QR Code, PDF 417, EAN, UPC, Aztec, Data Matrix, Codabar) within images. The code Injecting TagHelper given below is in the entire Application. The dependencies given below are required to create QR Code Application. You can download other ASP.NET Core 1.0 source codes from MSDN Code, using the links, mentioned below. We learnt how to create a QR Code Generator in ASP.NET Core 1.0 Using Zxing.Net. I hope, you liked this article. Please share your valuable suggestions and feedback. The server response was: 5.5.1 Authentication Required.